Summer is in full swing, you’re rolling with your squad Downtown, and as you’re taking a stroll through the Ballpark District, you find yourself in front of two unfamiliar, black-trimmed doors. You walk inside and are immediately transported to a space with an authentic Italian villa feel. On one side, beams of natural light illuminate the open bar area. On the other side, a sumptuous reception awaits you... Welcome to Potente, Downtown’s newest Italian fine dining restaurant on the corner of Texas and Crawford. Since its grand debut in April, Potente has generated quite the buzz and captured the hearts and palates of Houstonians, including some of our very own Astros players. Its selection of Italian-style fare infused with an Asian kick includes sizzling steak and fresh seafood options such as their tonno crudo (raw tuna, foie gras, preserved lemon, and caper berries) and artistically crafted desserts like the almond semolina cake with a black cherry barolo reduction. This 150-seat restaurant is unlike anything we’ve seen Downtown. 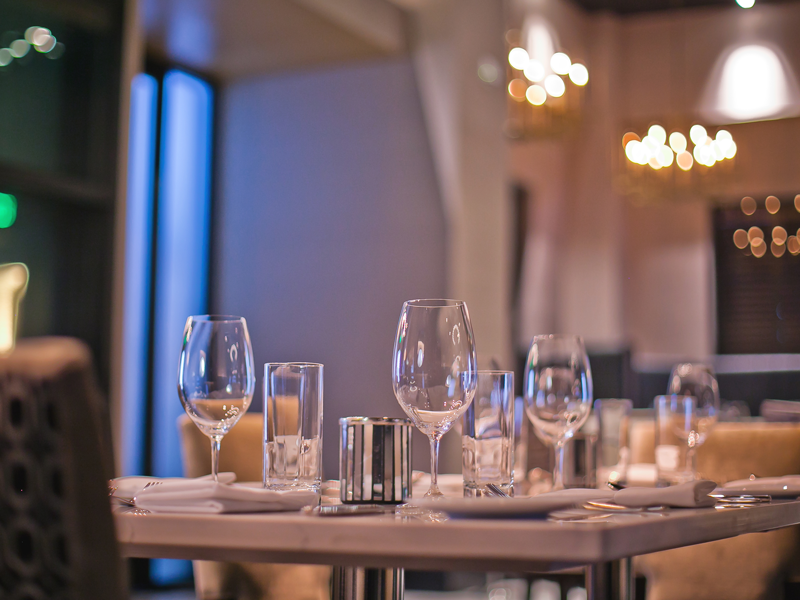 Aside from the great food and talented chefs, Potente also has a private indoor terrace and wine room available for small dinners, and offers exclusive wine lockers for guests looking for that over-the-top VIP experience. One of the most compelling features of Potente is its location – on the ground floor of 500 Crawford. Marvy Finger, property owner and founder of The Finger Companies, knew there were major advantages to building a mixed-use residential building. His goal was to create an urban lifestyle for residents designed to complement the walkable, cosmopolitan lifestyle that comes with living Downtown. “From the outset we conceived the building to include ground floor space slated for retail and, specifically, two different restaurant concepts. The reason for that is pretty simple: people looking to live Downtown are seeking a Big City lifestyle that comes with restaurants, watering holes, and recreation in addition to performing arts, entertainment, and sports venues,” Finger said. Identifying the right tenant for 500 Crawford wasn’t an easy task for Finger. “At the end of the day, we wanted concepts that would be good for our residents and for Downtown Houston as a whole,” he said. It wasn’t long before Astros owner Jim Crane jumped at the opportunity to partner with Finger. “Marvy and I had been in discussions about his mid-rise for several years. We’re both interested in driving activity in the Downtown area and recognized this as a good opportunity.” It came as no surprise to see the highly accomplish businessman open not one, but two Italian concepts simultaneously in his first foray into the culinary world (Potente and Osso & Kristalla, its more casual trattoria sister restaurant). Crane’s long-term vision is for Houstonians to come Downtown and spend time before and after the Astros games. And just like that, the Ballpark District has joined the realms of Downtown’s premier culinary destinations.